You may want to keep your ruler nearby if you’re planning to promote your business on Facebook. The social media giant is cracking down on Promoted Posts that include more than 20 percent of text on photos. I know that Facebook is cracking down because I got an email from their ad team saying Park Nicollet’s Facebook page broke the rules. Facebook uses an automated tool that can quickly review and determine whether each cover photo or post that you want to promote is compliant. The new rule started on January 15, according to the article, and was added to the Facebook guidelines as a way to minimize loud and obnoxious marketing messages from overtaking News Feeds. 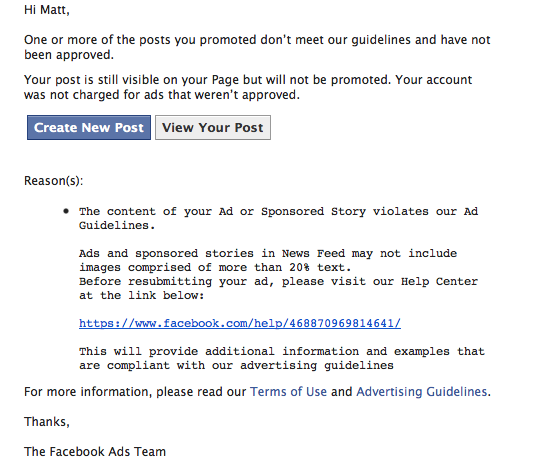 Facebook felt this rule was necessary as more and more businesses experimented with Promoted Posts. 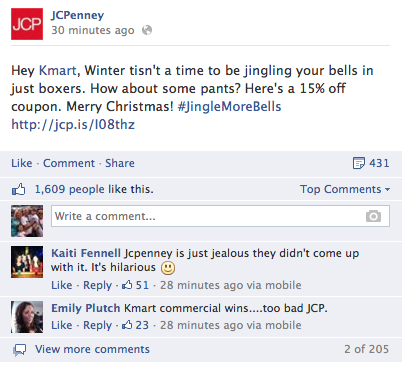 While we got flagged for this particular post, Park Nicollet has used other Promoted Posts with great success. We’ve used it several times to share stories to a wider audience, receiving many more likes, comments and shares. Plus, our Facebook fanbase has grown thanks to the Promoted Posts. Rules are nothing new for Facebook. It has a policy for what can be included on a cover photos, how contests can be run and restricting calls to action, such as “Get it now” or “Tell your friends” – but those rules are rarely enforced. It’s good to know Facebook is standing by its word – on words. On Wednesday night, Mitt Romney and Barack Obama met in Denver for their first presidential debate of this election season. Not surprisingly, the highly anticipated showdown was the talk of Twitter, including from one unlikely political pundit. I can only speculate what happened here, but my guess is the person who manages Kitchen Aid’s Twitter account accidentally Tweeted from the company’s account instead of from their personal account. Again, that’s just speculation, but I could see how it could happen. Whatever the case may be, this is a great reminder to Tweet carefully. No Tweet is that important that you must rush it out and make this kind of mistake. Also, a good practice that I follow is if you’re going to Tweet something controversial, type it out then walk away from your computer for a moment. Take the time to think of all the ramifications that it might come from that one Tweet. The person from Kitchen Aid who posted this Tweet is going to have a tough day at work on Thursday. That is if he/she still has a job.